Clay undergoes a remarkable transformation when fired in a kiln, changing in molecular structure as the kiln heats up and cools down. Perhaps one of the most important stages is quartz inversion, which affects ware in the bisque and the glaze firings as the kiln temperature rises and cools back down. Obviously, these changes can be hard on ware so there are guidelines to avoiding problems that you can follow when firing clay. In today’s post, an excerpt from Electric Kiln Ceramics, Frederick Bartolovic and Richard Zakin explain three important stages in kiln firing and share their advice on steering clear of problems. – Jennifer Poellot Harnetty, editor. There are several important temperature ranges to be aware of during the firing. During the firing process the molecular structure of the clay is changing as the kiln heats up and then cools back down. These changes can cause great stress on the physical structure of the ware in the kiln and progressing through these stages too quickly can cause drastic results. Here are some guidelines. Use your electric kiln to its highest potential! Now is a great time to pick up your copy of the 4th edition of the classic book Electric Kiln Ceramics, which has been completely rewritten, reorganized, and expanded by Frederick Bartolovic. Loaded with new color images that highlight some of the most beautiful results possible with electric firing, the new edition features step-by-step instruction on forming and finishing pieces for electric firing, schedules for firing both manual and computerized kilns, and even glazing techniques and recipes to try out in your electric kiln. The ware inside both bisque and glaze firings are subject to quartz inversion as their temperatures reach (1063°F/ 573°C). At this temperature quartz changes from the alpha to the beta state, which means that the molecules rearrange themselves and expand 1–2% during heat-up, and contract the same amount during cooling. 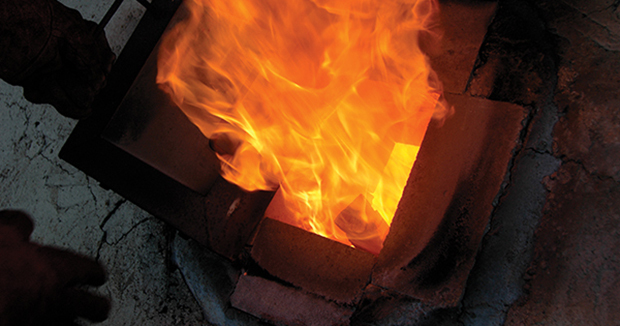 Though quartz inversion affects bisque ware both in bisque kiln and in glaze kilns during heating, quartz inversion has a much greater impact on glazed ware which has reached a point of maturation. This means that it is important to be cautious of cooling a glaze kiln through quartz inversion and heating an already finish fired piece back up again. Cristobalite is a form of crystalized silica which occurs naturally in some clays (particularly high iron non-vitreous stoneware bodies) when fired above cone 3. At 428°F/ 220°C during cooling these crystals rapidly contract and shrink 3%, potentially causing dunting or cooling cracks. Though the ware inside the kiln may not be composed entirely of cristobalite crystals, this is point where the ware (if cristobalite is present) undergoes a great amount of stress and needs to be cooled slowly. Cracks may be caused by an overly rapid firing cycle (especially during the early stages of the fire) or by rapid cooling. To deal with cracks that occur during heating, the kiln should be heated more slowly. To deal with cracks that occur during cooling, the cooling cycle needs to be slowed down. It can be difficult to tell whether cracks were formed during heating or cooling cycles. If possible look at the glaze around a crack. A cooling crack will usually be sharp like broken glass whereas a crack formed during heating will show signs of the glaze healing over and even possibly running or dripping into the crack. clay, cristobalite, dunting, foot, iron, stoneware. The caption to the picture above -“This image shows one of Tom Turner’s perfectly even glaze firings from his 12-cubic-foot front-loading electric kiln.” Which doesn’t necessarily mean he didn’t fire it to 9/10, but reduction is a little tougher. Are you sure it’s electric? Looks like cone 9/10 reduction to me. the image showing Tom Turner’s kiln is truely inspiring. Even more interesting is the fact that he managed to produce beautiful oxblood glaze in an electric kiln. Could someone share the knowledge?